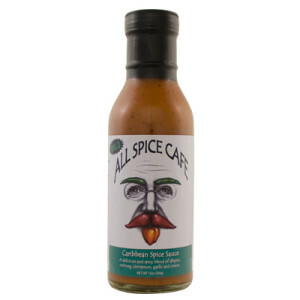 I don’t so much eat All Spice Cafe’s Caribbean Sauce as mainline it like pepper heroin. It’s really tasty to me. 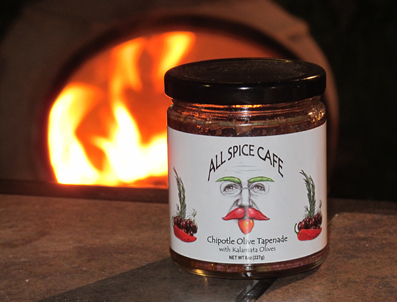 Cayenne pepper, nutmeg, allspice, and cinnamon are the major players in it but you’ll also pick up a bit of turbinado sugar and black pepper when it hits your taste buds. Taste buds don’t have teeth but if they did, that’s where the fire would kick them. The flavor has about a 10 to 15 second head start on the spicy but once it shows up, it’s very clear about its intentions: giving you a mild to wild capsaicin rush depending on how fast you eat the stuff. Although there’s a sugar presence here, it’s subtle. The Caribbean sauce favors the sour side. Having said that, I was inspired to use it with pig in a way I’ve never tried before. No, not that way, you perv. I marinated two pineapple rings in it for two hours. 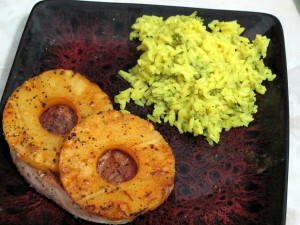 Using just enough sauce to coat them, I soaked the pineapple in the fridge before grilling both the rings and some lean boneless pork chops as a delivery system for the sauce. The hot sauce held up well under (over?) fire. Those rings packed the heat and the other flavors of the sauce came through also. Not as well as I would have liked but I think that’s just because I should have marinated them longer. In a Ziplock bag, coat the rings with the sauce. Marinate them in the fridge for at least three hours. Coat the chops in your favorite Jamaican Jerk seasoning. 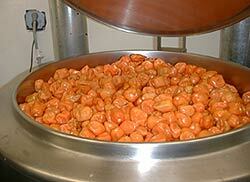 Refrigerate them for 35-45 minutes. Heat your grill to medium-high for direct cooking. 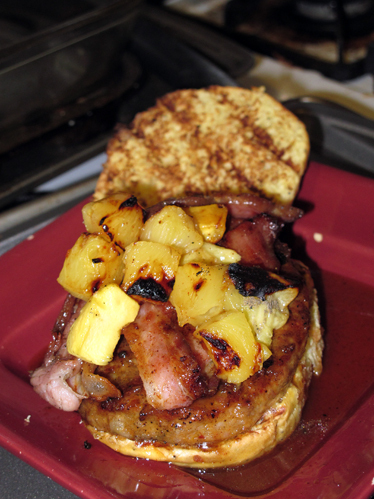 Grill the chops, lid down, for 6 minutes or until juices start to appear on top. Flip the chops and repeat the previous step. 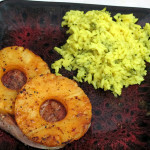 Grill the pineapple for 3-6 minutes per side. Serve the chops with two rings on top of each.